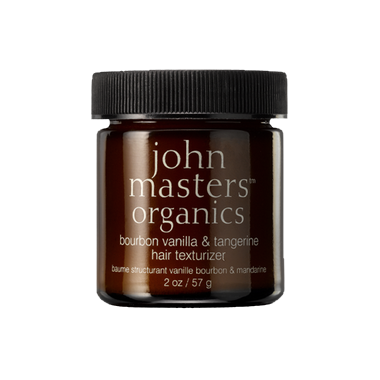 John Masters Organics Bourbon Vanilla & Tangerine Hair Texturizer provides an extra-strong hold from all-natural ingredients. I've purchased this several times from well.ca and I love this hair texturizer. It is amazing! I highly recommend it. Great product. Not the best hold, but the hair looks great using the product, and you only need a very small amount to do the job. Awesome smell!! Love this product, the smell and texture is wonderful but use it in small amounts. Not recommended for holding extreme styles but works beautifully as a texturizer. I love the hold and the smell of this product. Use sparingly, though it's a pomade it doesn't have a firm hold, it gives the hair a soft texture however, if you use too much it just looks greasy. Washes out beautifully and keeps frizz at bay in humidity. Will work well for all hair types, just start out using very small amounts. Great hold and the smell is just amazing. A little costly though, for the small size.